UK, 1951, 90 minutes, Black & white. Bette Davis, Gary Merrill, Emlyn Williams, Anthony Steel, Barbara Murray, Reginald Beckwith. If one wanted to choose a melodramatic Bette Davis vehicle, Another Man’s Poison would be high on the list. The film was made in England, Bette Davis starring with her then husband Gary Merrill with whom she had appeared in All About Eve and Phone Call from a Stranger. English actor and playwright, Emlyn Williams, plays the inquisitive doctor from next door. (Williams wrote The Corn is Green which was a star vehicle for Bette Davis in 1945.) Anthony Steel and Barbara Murray have supporting roles with Reginald Beckwith a comic character from the village. The setting is Yorkshire, although the film was based on a play by Leslie Sands, Deadlocked. Bette Davis has the opportunity to chew the furniture as usual. The film is complex, she playing a writer of crime novels. 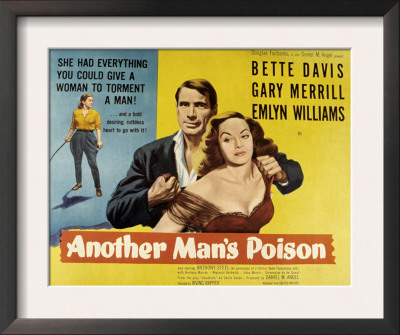 As the action emerges, it appears she has killed her husband, Gary Merrill appearing as his partner in a bank robbery, passing himself off as her husband, despite the curiosity of the local doctor. Anthony Steel plays a young man who is infatuated with Bette Davis. Barbara Murray is his fiancée. The screenplay has quite a number of twists – the final twist being very strong, with Bette Davis a victim of her own machinations – and a close-up of her laughing, even as she dies. Certainly a melodramatic Bette Davis (reminding audiences particularly of Susan Sarandon, her facial expressions and her eyes). The film was directed by Irving Rapper who directed Bette Davis in Now Voyager, The Corn is Green, Deception. 1. Audience enjoying a high melodrama? Performance, situations, interactions? Heightened? 2. The English setting, an English production? Yorkshire, the house, the village, the lake, the moors and the cliffs? Atmosphere? The atmospheric score? 3. The title and its irony, Janet murdering her husband, murdering George? Her own death? 4. The introduction to Janet, walking the countryside, the phone call to Larry, her demands? Her encounter with the doctor? His giving her a lift? In the house, discovering George? The confrontation, her demanding him to leave? His hold over her? The arrival of Larry and Chris? His impersonation of her husband? 5. The character of Janet, a successful writer, living as a recluse? The failure of her marriage? Her husband’s absence? The irony of the photo on top of the cupboard? Her hold over Larry, possessiveness, defiance of Chris? Chris as her diligent secretary? The revelation that she had killed her husband? The importance of getting rid of the body, George helping her? The cat-and-mouse awareness of each other? The various forms of blackmail? Her having to pretend that George was her husband, to the doctor, to Larry, to Chris? 6. George, his arrival, his background, explanation of himself? His working with Janet’s husband? The robbery, the shooting of the policeman? The escape? His coming to find the husband? The gun, the fingerprints? The newspaper reports, the photo and the doctor’s questions? George being on edge, his drinking, terseness? The irritation of the frequent visits to the doctor, borrowing the dictionary? His anger towards Larry? Abruptness towards Chris? Towards the housekeeper? 7. The doctor, his place in the village, the vet? His helping with Fury? The medication? His wanting it back? His suspicions? Borrowing the dictionary? His frequent visits, accosting George about the photo in the paper? His tending Fury, Fury’s death? The revelation that he had met the husband, that he knew the truth all the time? His continued probing? His car, Janet urging George to take the car even though she knew the brakes and the steering had failed? His vindication? 8. Larry, his infatuation with Janet? His engagement to Chris? The phone call, his hesitations, his going riding with Janet, the dalliance? Yet his love for Chris? The antagonism towards George? The advice? Chris leaving, his going after her? His listening to Janet’s outburst after Fury’s death? 9. Janet, talking with Fury, riding Fury, the portrait? Her love of the horse, her dismay at the death? Its affecting her judgment? 10. The newspaperman, his visit, the request for George to make a speech? In the village, the newspapers? 11. Chris, her quiet work, the behaviour of George? Her confrontation with Janet, the ring, Janet’s callous remarks to her, her leaving? 12. The build-up to the blackmail, Janet and her hold over George, George over Janet? The dead body, the poison, Janet saying he was not dead? The finale with the drive, Janet wanting George dead, his surviving the wreck? The irony of the insurers and the police, discovering the hat, the dead body? George and his drinking the poison – Janet’s victory over him? The irony of her fainting, the doctor giving her her drink – and her being poisoned? 13. The melodrama of her final laugh?